Ah, the creative process. Do we love or hate it? As right-brained humans, we tend to lean toward drama and therefore, most of us will familiarise the Creative Process as something like the above comic. I’m not going to lie; this made me chuckle. 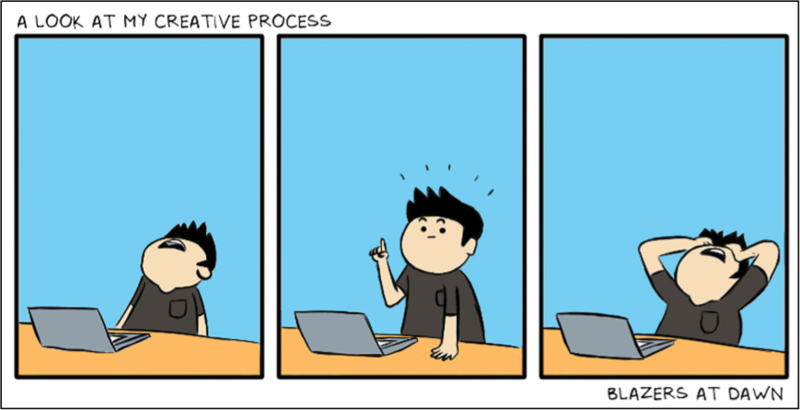 The creative process is not this hard, however how much we all think we relate to it. In saying that, it definitely does involve frequent back-and-forth idea nurturing, but when it comes to the creative process for Video Production, it’s actually very streamlined and if followed correctly, can lead to extremely successful videos. The fun part, right? HA! This point will have most people reacting like the guy in the first slide above. But with the dread of hours of research in front of you (which let’s face it, is made for the left-brainers) also comes the egotistical burst of achievement when you start developing ideas. Research undoubtedly is the most crucial aspect of the creative process. If you’re developing an idea for a video and miss this crucial step (or ignore it), you’ll be doing yourself and your company a massive disservice and will most likely end up with a video with no purpose, nor meaning. Our recommendation? Grab a coffee, a bright spot in the office with windows, and turn on that laptop – because the information you can get by researching your project can lead to the most engaging of ideas. Congratulations! Your tireless work researching has resulted in an idea egg (or three). So what’s next? Incubate it. Sit on that idea and work on it. Ask yourself questions and get to know your project theories in more detail. How will this idea grow into the production you need it to be? Is it reaching the right audience – if not, where does it need to change? What is it saying? What do I essentially want it to say? How long will it be? What platforms will this be shown on? How will my audience perceive this? The more questions you ask and answer, the more your ideas will come together. This point takes a little while to complete, and it’s definitely not a point to be rushed. Think carefully about the message you want to convey throughout your video and invest time inviting those around you for their opinions, including hearing what will work/won’t work with your Video Production Company. The most profitable films and videos require creativity and collaboration. So, take the time to involve others! You’ll be standing in the shower having just applied shampoo, or walking the dog when this ‘aha’ moment kicks in. After all the incubating you have done (excellent work by the way), your subconscious has been ticking away working tirelessly to create one incredible little idea out of all the seeds of creativity supplied to it. Your subconscious is that employee we all fear; the one you never see but works the hardest and jumps out when you least expect it just to remind you how amazing it is. The most enjoyable part about this stage – is that once you have that ‘aha’ moment, you can move to stage 4. Yay! Reflection is another crucial but very dreadful stage of the creative process and is most often linked to the 3rd slide in the above animation. It involves a great deal of self-criticism and nurturing of your ‘aha’ moment to get it to where it needs to be. This is the point where you need to establish what makes your idea engaging and how you’re going to convey that message to your audience properly. Additionally, you can re-visit the incubation stage and talk to colleagues, project managers and of course your video production team to really refine your idea before filming begins. Write scripts and interview questions (if applicable), and definitely write up a filming schedule with the help of the production team to ensure you’re video stays on track throughout. Also have a look at what graphics are needed for the editing process – what branding material do you want included? Supply this to the production team before filming along with a brief outlining the purpose of your video. You want to make sure that the team filming your video knows the in’s and out’s of what the video is for. You’ve made it! Congratulations! Give your self a pat on the back, because this is the stage where other people get to step in and develop your idea into reality. If you can be on set throughout filming and give direction where needed, but otherwise sit back and enjoy it! After filming, the editing process will be begin. Impose deadlines for your production company so that they identify what to work toward (creative people secretly LOVE deadlines). Make sure you examine the video a few times before delivering your comments and edits back to the production team – the more clear information you give them in one hit, the better the editing process will be. If you’re not convinced, ask someone else. A second opinion always helps with clarity.